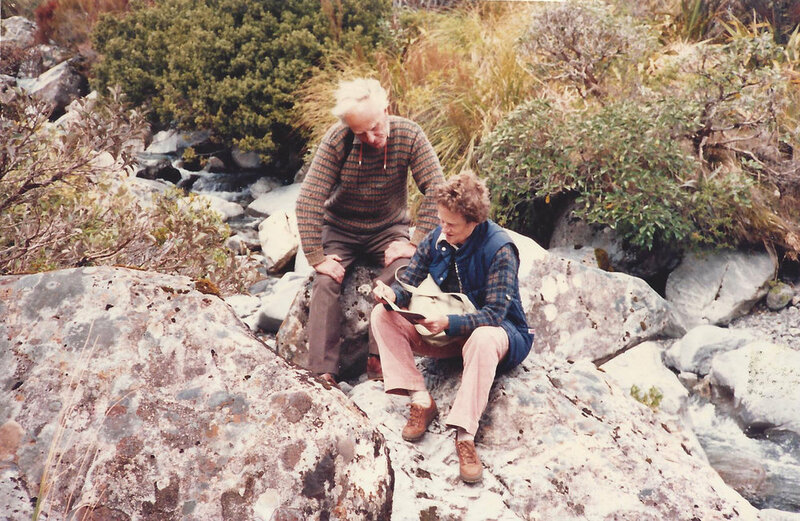 Anne Boscawen shares her recollections of travelling the world in search of rhododendron species. When Edward first took me to see the gardens of his family home in Cornwall, I knew nothing of rhododendrons, and he very little, but the waves of scent, at dusk, which greeted us that evening, could never be forgotten. It came chiefly, I think, from the Maddenia hybrids, Rhododendron ‘Lady Alice Fitzwilliam’, ‘Countess of Haddington’ and a big plant of R. griffithianum.Cornwall has a variety of landscapes, and the numerous deep gulleys shelter several wonderful collections of rhododendron species, many grown to a great size. There are also big specimens of many of the old hybrids but ‘to see these plants in all their true majesty, you must go to High Beeches in Sussex’.1In 1966 we had the great luck to acquire the ‘Pleasure Ground’ at High Beeches, in Sussex, along with the derelict farm and ruined mansion. It was the original home of the Loder family, when they first settled in Sussex, and an outstanding garden had been created there, but when Colonel Loder died, it was publicly auctioned, and could have been lost forever.Hoping to learn more about our plants, we joined the International Dendrology Society (IDS) and the local Rhododendron Group, of which Edward became the Chairman for a time.As we were now responsible for so many rhododendron species (and other important genera) within the garden, we wanted to see them in their native land, and so, in October 1984, we joined an IDS expedition to East Nepal. This was to be our first great adventure among many others, and what follows is a series of short and very personal recollections of the trips Edward and I took between 1984 and the dawn of the twenty-first century. The world changed a great deal during those years and I hope a sense of that period comes across in my words, which are largely drawn from notes written at the time. As I said, this trip was to be a great adventure for us and we were not disappointed. We walked a mountain trail through huge Rhododendron arboreum, and on up the Milke Danda ridge. On exposed ridges, with a view of Mt Everest, there were quantities of R. campanulatum.We collected seed of what proved to be a lovely white-flowered form of Rhododendron ciliatum,R. anthopogon and a few Pinus densa which survived at this altitude. The steep slopes were densely covered with rhododendrons, including R. thomsonii, R. hodgsonii and, closer to the path, R. glaucophyllum and R. cinnabarinum with its silvery glaucous leaves.We were 21 in the group, from seven countries, and with Sherpas, cooks and porters, we made up a party of about 100 people, which was really far too many. [In remote areas resources are scarce, and visitors should bring their own food, and remove all their rubbish.] Sometimes kerosene for cooking had to be carried by the porters, and water brought from a river far below. We ate mostly rehydrated dried food, and did our best to persuade the porters to collect only dead wood for a camp fire. High up, wood becomes very scarce, and is used only for cooking.High Camp was at 3760m, with ice on the tents, and it was Chris’s birthday, so there was a camp fire, a cake, beautifully decorated, but heavy as lead, and Milke was carried off by the Yeti (Mingma in a mask and draped in moss). Prague, the capital city of what is now known as the Czech Republic, is in the region of Bohemia, and the place of origin of King Wenceslas. It was never damaged in the Great War.In June 1985, when we were there with the IDS, Czechoslovakia was still behind the ‘Iron Curtain’. The curtain was more of a ‘net’ by then. Nothing was as it seemed, and no written word could be believed. There were many anti-Russian jokes among the German speakers in our party, which frustratingly we could not follow. The Czechs were frantic for news of the outside world, as all contact was forbidden, except with Russia, and although the botanic gardens were conducting much research, it was usually distressingly out of date. At Průhonice there were many hybrid rhododendrons, bred for their hardiness. Some were registered, including Rhododendron ‘Petr’, which we have at High Beeches, also ‘Beautrice’, 1962, ‘Blanice’, 1969, and ‘Violetta’, (scented), pre 1977, with many more.Winters there are very cold, and Rhododendron smirnowii was much used to produce hardy hybrids. From September 26th to October 17th 1986 we were with an IDS tour to South West Australia. Rhododendron lochiae, from the rain forests of the extreme north in Queensland, is the only rhododendron endemic to Australia, but there are places where many introduced species and hybrids are successfully cultivated.There are so many microclimates, and such a hugely varied flora that it needs more than a lifetime of study. We were very lucky to have a local botanical expert as our guide.At the King’s Park Flower Show, in Perth, we were told that in South West Australia there were a hundred times the species known in the UK, but that many only flower for two weeks in the year, depending on the rainfall. Remarkably, our guide had managed to arrange that we were there at exactly the right time! We were familiar with some of those plants that succeed in the Abbey Gardens, Tresco, in the Scilly Isles.We spent an interesting afternoon touring the Adelaide Parklands. Efforts were then being made to restore them to nearer the original plan drawn up by Colonel William Light in 1840 when he designed the city. North of Adelaide we visited Panmure; situated in a valley, with a special microclimate, it was like stepping suddenly into a Cornish garden! It was a privately owned garden, then being restored. There were many rhododendron species and hybrids, and Kurume Azaleas.Our last visit was to Mount Lofty Botanic Garden, planted from 1952 on acid soil, and with a rainfall of 50ins. One of five steep ravines is dedicated to rhododendrons. The climate of New Zealand is a paradise for all our three genera. There are no native rhododendrons, and there are stringent laws on importing plants. The first rhododendrons to arrive were mostly grown from Kingdon-Ward seed, and we saw some very splendid plants.In October 1986 we explored the South Island on our own for a week. 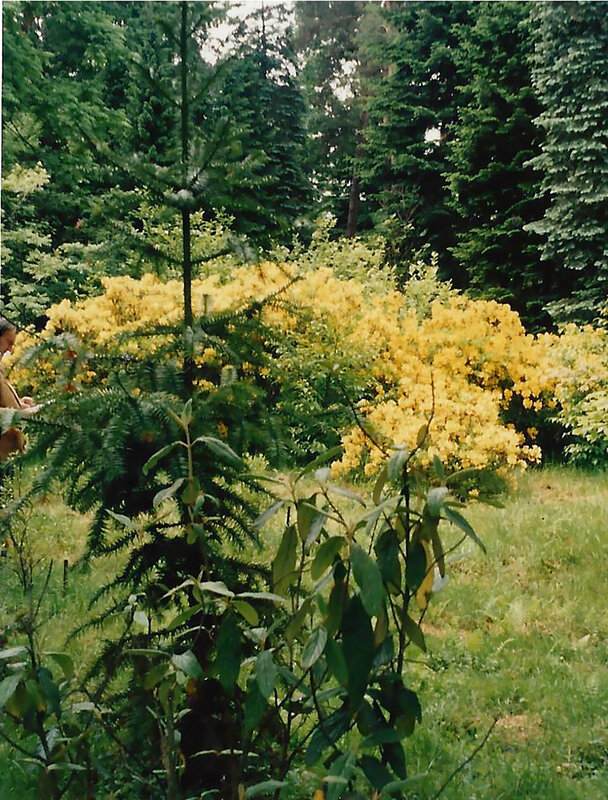 The garden round our hotel by the lakeside at Te Anau had many hybrid rhododendrons, including one very good yellow. We enjoyed the boat trip to Milford Sound, with its dramatic waterfalls. Also in the South Island, in the Christchurch Botanic garden, we did see a small ‘English’ garden by a stream with some azaleas and primulas, but an unexpected freezing cold wind made it difficult to appreciate this collection properly.In the North Island we were befriended by Alan Jellyman and the New Zealand IDS.We flew to Auckland, and made a quick visit to the Arboretum, and the very interesting Otari Native Plant Reserve, and on to New Plymouth, where we were met by Alan, and taken at once to join a NZ IDS Group gathering. We saw the Vireya species Rhododendronmacgregoriae in Alan’s own very interesting garden.Alan then took us to see Bernie Hollard’s garden, and we were made welcome by Mr Hollard and his wife. They were then in their eighties, and until shortly before our visit, had looked after the garden entirely themselves. It was then taken on by the Queen Elizabeth Trust, a body a little like our own National Trust. We saw a species of Bomarea caldesii scrambling through Rhododendron ‘Royal Flush’, many old azalea hybrids, R. nuttallii 12ft high and R. protistum var. giganteum ‘Pukeiti’ KW21948.Many of the rhododendrons in the Pukekura Public Park came from Slococks Nurseries in 1936 and included a number of old hybrids, but sadly, many labels are lost.The gardens of the Pukeiti Rhododendron Trust were then thirty-five years old, and had suffered much recent damage from gales. Ambitious restoration was in progress, and we saw Rhododendron nuttallii 12ft tall, R. magnificum,R. dalhousiae, R. simsii KW22036, R. protistum var. giganteum ‘Pukeiti’ KW21948 again, and many more from KW seed. There are also many old hybrids, but, once again, many names are lost.At Tikorangi, Felix Jury had plants from all over the world, and many of his own lovely crosses, especially of magnolias. Rhododendron nuttallii seeds itself in the moss.We also visited the giant Kauri Pines, Agathis australis, in Waipou Forest Sanctuary. The great Tane Mahuta, was then 51.2m tall, and 17.2m in circumference. The large forests were ruthlessly exploited both by Maori and settlers.Back in Auckland, Chris Williams took us to the top of One Tree Hill (Pinus insignis) and backed his truck at speed all down the steep spiral track!New Zealand plants some-times do less well in the UK. 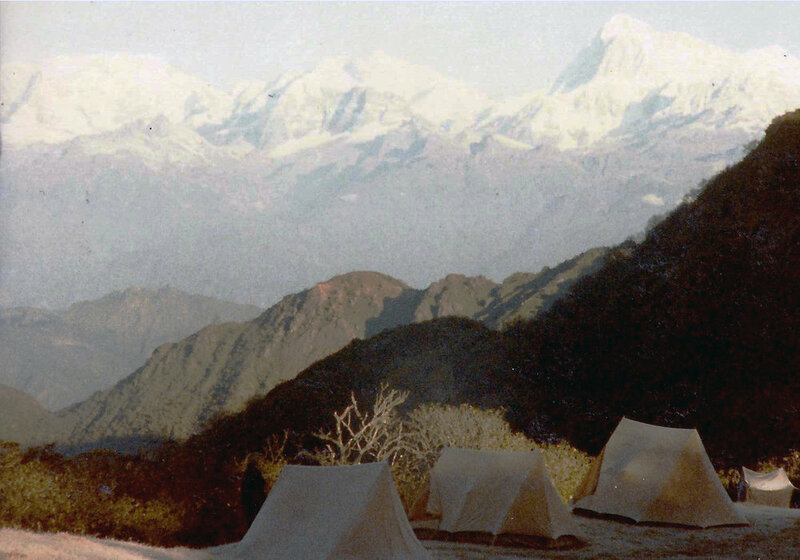 Very few people had then visited Bhutan, but in May 1987 we were lucky to be invited to join a small independent botanical expedition.We crossed the frontier between India and Bhutan – the ‘Dragon Kingdom’ – at Phuncholing. There was a lovely Cupressus cashmiriana beside the Customs House. A motor road runs right across the country, from West to East but often work was in progress, for improvements or after landslides.Leaving Phuncholing in our minibus, which being Japanese, had very little leg room, we started to drive up the winding road over the mountain range which separates Bhutan from India.We stopped at a road workers’ camp, to see a large-flowered yellow rhododendron, in an open space in the middle of the camp, and this was later identified as a Rhododendron dalhousiae ssp. We drove on to our hotel in Paro, seeing quantities of interesting and exotic plants from the bus.From Paro, we walked up a very hot and exposed path, to a restaurant just below a monastery high on the cliff, and known as the Tigers Nest. We collected seed of a brilliant red Rhododendron arboreum, flowering beside the path. [Three plants succeeded, and we registered the best as R. ‘Tiger’s Nest’. ]Driving on next day, we crossed the Dochu-la, with many stops to explore the banks above and below the road. The deep ravines were full of pure white Magnolia campbellii,Tsuga dumosa, with epiphytic Rhododendron lindleyi, splendid giant yellow-flowered R. arboreum with red-brown trunks, and much else besides. We lunched at a café just below the summit, which was surrounded by large deep pink flowered rhododendrons. Close examination revealed this to be a new species, hitherto assumed to be a hybrid of R. hodgsonii. This was later registered as R. kesangiae, in honour of the then Queen Mother of Bhutan. We crossed many high passes, and near the Pele La we saw R. lindleyi clinging to clumps of moss on Quercus oxyodon. At Jakar, we left the road for two days, climbing with tents and ponies to the Hanging Valley of Phokphey, most of the time through drenching rain. Edward and two others took the ponies up to 4000m just below the Rudong la, and saw R.flinckii, R. bhutanense, R. nivale, R. setosum and R. wightii, knee high, under 6 inches of snow.On our way back, we picnicked at Chendabi, a very holy site, enclosed by two rivers. The Chorten and prayer wall were surrounded by green sward, closely cropped, possibly by sheep, and it resembled a natural garden, with Rhododendron griffithianum in full flower and Clematis montana scrambling through it. On the roadside banks were Coelogyne corymbosa, a white-flowered scented orchid; the woods above were full of rhododendrons. 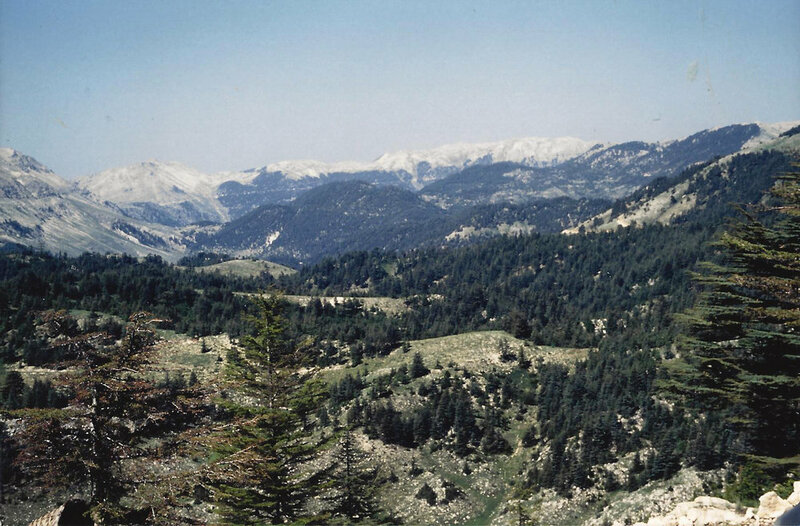 In June 1993 we were in the south of Turkey, with a very wide-ranging and exciting IDS tour. There were then very few gardens or arboreta in Turkey, but we explored some near Istanbul, and visited many mosques and churches, including the Topkapi Palace, Santa Sophia and the Blue Mosque. We were guided round the Attaturk Arboretum, where we learnt that two of our best known rhododendrons Rhododendron ponticum and R. luteum are native to the Caucasus. [R. ponticum has become a major pest on acid soils throughout the UK, and the lovely scented Yellow Azalea seeds itself profusely, and can be a nuisance.] R. caucasicum, R. ungernii and R. smirnowii are all from the North East, near the Black Sea, and notably hardy.We had a few days on board gulets, and travelled inland to see Cleopatra’s great Cedrus atlantica forests. We finished our tour among the rose fields round Isparta. Rosa gallica is grown there for the scent industry. The IDS Tour to North Carolina in May 1996 was very important to us, as we grow so many of their wonderful trees, which also colour here in the autumn so spectacularly.We visited Mount Vernon, home of George Washington, and Thomas Jefferson’s Monticello, both of great historical interest.Biltmore is extraordinary. It belongs to the Vanderbilt family, and the design of the mansion was modelled on three of the Loire chateaux! Everything in the garden is planted by the hundred, or even more. The 15-acre Azalea Garden had the most complete collection of US native azaleas known. Unfortunately, there were few labels. The grounds, originally planned by Frederick Law Olmsted, had been neglected, but were then being restored by a local volunteer society.Escaping to the countryside, we walked a trail on the lower slopes of Grandfather Mountain, at 4000ft altitude, through deciduous hardwood forest, and saw Rhododendron maximum, R. atlanticum, R. vaseyi, R. calendulaceum and R. catawbiense. Driving along the Blue Ridge Parkway, we saw R. vaseyi in flower at the roadside at 5000ft altitude, also R. periclymenoides, and R. carolinianum.Merchant’s Mill Pond, where Nyssa aquatica, and Taxodium distichum grow in the shallow water, was once a busy commercial mill, now a serene and lovely place. We wanted to take a two-hour trip in a canoe to the centre of the pond, where there is a beaver lodge, but there was no time.On another day we walked through the Joyce Kilner Memorial Forest. This is an impressive remnant of American virgin wilderness. The trail took us through carpets of native wildflowers, under a high canopy of a great variety of deciduous trees. We all, including Lance, our American guide, agreed afterwards that there we felt our spirits lifted, as though we were in fairyland, treading lightly through this magical place. In April 1998 we were in South Korea with the IDS. The scenery there is enchanting. The mountains are covered with a wealth of trees, many known in UK gardens, with pink granite peaks emerging, and big plants of Rhododendron schlippenbachii and R. weyrichii in the understory, and R. yedoense var. poukhanense, the ‘Korean Azalea’, in open spaces. The street trees between the skyscrapers in Seoul are ginkgos and metasequoias.We explored many temple gardens. The Garden of the Constitutional Court is terraced using big boulders, and a magnificent Lacebark Pine is complemented by several magnolias and drifts of R. yedoense and R. yedoense var. poukhanense in muted shades of mauve and a pink-lilac.We then flew south to Cheju Island, and there saw several gardens. Driving on uphill, towards the Halla San, at 1950m the tallest mountain in South Korea, we stopped to explore the mouth of the Andok River gorge. Rhododendron weyrichii was in flower and we were treading on a carpet of fallen Camellia japonica flowers.We stopped again to see the rim of a volcanic crater, Samburi, 400m deep. Within the crater is a special microclimate, suiting Korean Azalea and a wealth of other plants, mainly evergreens, on the south-facing side, and deciduous on the north.Back on the mainland, in the Sorak National Park, on an exposed ridge at about 1000m, Rhododendronschlippenbachii was in flower, amongst a wealth of other trees and shrubs. In Poland in May 1995 we explored the Old Town district of Warsaw which was completely destroyed in World War II, and has been faithfully restored in every detail. We visited many gardens and also arboreta which had also suffered, and were recovering. The climate is Central European, and most rhododendrons struggle, but we saw Rhododendron ‘America’, a good dark red, colourful beds of R. luteum hybrids, Kurume azaleas, R. groenlandicum (Ledum groenlandicum), which is circumpolar at this latitude, and sometimes known as Labrador Tea, R. palustris, R. catawbiense,R. purdomii and also R. ‘Gomer Waterer’, a favourite of ours at High Beeches.A part of the Bialowieza Forest is now a strictly protected National Park, to conserve the native flora. Pedestrians are not permitted, so we toured part of the forest in horse drawn carriages. Back in the bus we drove away through the forest near the Russian border and passed many lonely wooden crosses, and small neat cemeteries,We visited many splendid palaces, now most are museums open to the public, with extensive grounds, and a great variety of mature trees. At Janow Podlaski, the famous stud where Arabian horses are bred, many young horses were brought out for us to see. 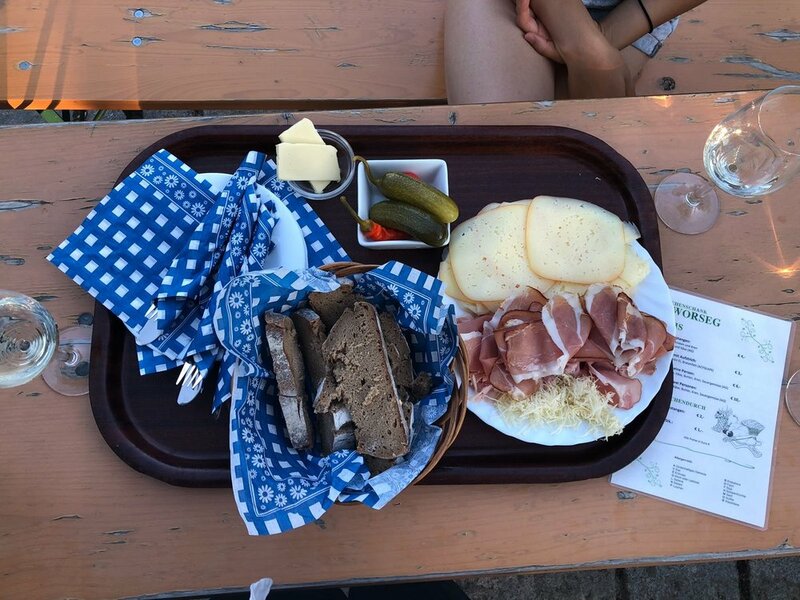 After the war enough were retrieved from local farms, and some from America, to continue the breed.Krakow, once the capital city, and the Wawel Castle, with its arboretum, took a whole, most memorable day.On our last day we had coffee in the main square in Warsaw. Here, we said goodbye to Dr Heino Heine, our dear friend and mentor. He said he was not coming back with us, and that he did not feel well. Dr Heino died soon afterwards, at his home in Mannheim. Stuart Thomas, Graham (1983). Trees in the landscape. Jonathan Cape. This article previously appeared in the 2016, RHS Rhododendrons with Camellias and Magnolias Centenary Year Book.